When most people describe The Philosophy Of Andy Warhol (From A To B and Back Again), they call it a loosely formed autobiography/biography of sorts filled with quips, bits, and reflections. Others consider it a work of superficial pop philosophy, in keeping with Warhol's work. A few think it's all junk. Whatever. It's an addictive piece of prose, even if he had help writing it (addressed later), maybe more brilliant than some people prop it up to be. It's been called all sorts of things, ranging from jarring to creepy and even a handbook to help you survive the American dream/nightmare. I don't think so. The Philosophy Of Andy Warhol can be defined in one sentence. It's a book about thinking differently about everything. It's that simple, with Warhol using recollection and reflection to apply the idea across any number of subjects — love, fame, work, time, beauty, etc. He applies the same to big things as much as he applies it to small things. Just before listing out a string of personal tragedies people experience in their lives, he puts it into perspective. Those three sentences are among the most clipped and taken out of context. They have much more weight in the book because he follows up with the problems. My mother didn't love me. My husband won't ball me. I'm a success but I'm still alone. So what. The point is pretty much made. It's not about being superficial or dismissive, but the realization you can focus your mind with just about anything. Given the human experience is relatively short, there isn't much point in focusing in on the miserable. There is a choice to be made, assuming you realize you can make it. It's one of the reasons Warhol gave up an entire chapter to buying underwear. It's important. The art of making big things small, and small things big. That is not say Warhol was always a master of his own philosophy. Two days before the assassination of Robert F. Kennedy, Warhol was shot by Valerie Solanas and barely survived. It had a profound affect on his health, life, and art. It may have even shaped the book, but not his outlook entirely. When some people look up this now 35-plus-year-old book, they come to the conclusion that it is about nothing. That could be true if you choose to look at it that way. But some of it is the allure of Warhol. While other artists were looking for something important to paint, he painted soup cans and Coke bottles and made them important. In film, he did it for a hamburger. He applied the same thinking to art and beauty. He didn't think art could be defined as better or worse, just different. And he felt the same way about people, leaning on the idea that everyone was beautiful. And even if they aren't beautiful, they were at one time or another. Beauty is temporal. "I usually accept people on the basis of their self-images, because their self-images have more to do with the way they think than their objective-images do," he said. "Maybe she's six hundred pounds, who knows. If she doesn't care, I don't." How the book came together. 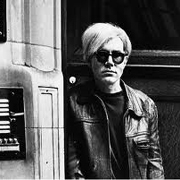 There are some people who aren't very fond of Warhol, especially because he was fascinated with mass producing art. He even considered art a business and being a businessman art. Eventually, he came to realize he could make money the hard way or the easy way. And he choose the latter. Some people are surprised to learn that Warhol didn't necessarily sit down and plunk away at the keys despite the New York magazine cover that said he did. It was a collaborative work, beginning with Bob Colacello, Pat Hackett, and including Brigid Berlin. Colacello was the first person Warhol had hired on as a ghost writer, but Colacello needed Hackett's help after realizing he had bitten off more than he could chew. Neither Colacello, Hackett, nor Berlin got credit at the time, but Hackett did co-write Popism with Warhol later. Colacello was especially bitter about it, even though Hackett wrote nine chapters to his four (and Berlin wrote one). But that is not to say that Warhol didn't "think" the book. Much of it was cobbled together from taped conversations between Warhol, Colacello, and Berlin. It also wasn't Warhol's intent to make a charade. Warhol frequently had people work with him on art. Creation and execution were two different things. The Philosophy Of Andy Warhol Paints 9.1 On The Liquid Hip Richter Scale. The reason the book is sometimes called inspired or even dangerous is because if you apply the same reasoning, it can free your head up a bit. It was true in 1975 when the first run was published (the iconic trade paperback edition appeared in 1977). It's true now too. It might even be more true because we are reliving part of the 1960s that fit so well in the Warhol world. He once described the 1960s as a decade when everybody became interested in everybody. In the 1970s, nobody was interested in anybody. The 1960s were cluttered. The 1970s were empty. 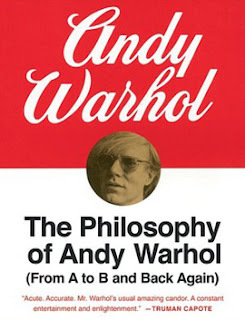 The Philosophy of Andy Warhol : (From A to B and Back Again) is still in print and can be found on Amazon. The book can be ordered from Barnes & Noble, but hasn't been released as an e-book. We have previously covered some of his art, focusing in on the abundance of prints available.